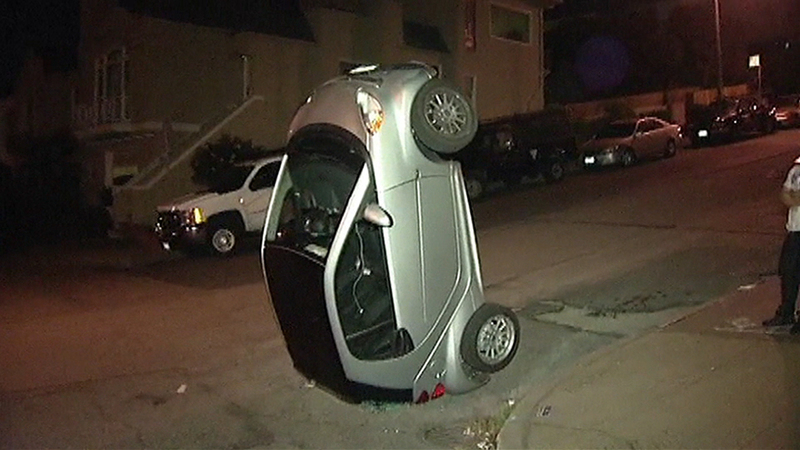 A recent rash of Smart Cars being tipped over in San Francisco has the police department on the lookout for a small group of vandals. Three of the vehicles were flipped within a 10-block radius of one another, with a fourth flipped in a separate neighborhood. The SFPD is investigating each case as felony vandalism, with early reports indicating the cars are likely total losses. A Smart Car weighs around 1,800 pounds, and can obviously be manipulated by a few motivated pranksters. Local San Francisco Bay Area media had a field day throwing around this vandalism as a form of "urban cow tipping," though car owners and area residents aren't amused.